Sadly November is coming to a close so we must bid adieu to our positively radiant November Leading Lady, Jessica Frost-Ballas. The last four weeks with Jess have been full of brilliant color, and design. Each project and post has been a delight. I feel so blessed Jessica shared her talents with us this month! If you missed her smashing debut you must see it...CLICK HERE or her sensational second performance where she made us swoon over her stunning cards in an elegant and dramatic color scheme...CLICK HERE! For today's performance Jessica takes us through an gorgeous journey through the seasons. or her triumphant third performance featuring a gorgeous journey through the seasons CLICK HERE. Good morning! Jessica here for my final Leading Lady post. :( I can't believe how fast November has flown by! I have greatly enjoyed my time on the Winnie & Walter blog and thanks so much to Shay (and Winnie!) for having me! :) For my last post I decided to focus on something else I love: interactive cards! I have always loved sequins and beads (pretty much anything sparkly) and you just can't help but smile when you shake around a card and watch all those pretty metallic bits shimmer and sparkle as they bounce around! As I mentioned last week I fell head over heels for the adorable critters in the last release and wanted to focus on them! I stamped the owl pair from Happy Owlidays with Evelin T Designs onto white cardstock with copic-friendly ink and then colored them with copic markers. I went with non-traditional holiday colors of teal and peach! I used the coordinating dies to cut them out and set them aside while I worked on the rest of the card. I stamped the scalloped banner from Framed with Evelin T Designs onto vellum with versafine and heat-embossed it with clear embossing powder. I also stamped and heat-embossed my sentiment from Happy Owlidays with Evelin T Designs. Next I fussy cut the banner and cut off the stakes to create a freestanding hanging banner. I used the Essentials: Carly Cutaways circle die to die-cut a white A2 panel for my shaker frame. Then I added a layer of acetate behind the frame and built up the back of the panel with foam mounting tape. I filled my shaker with a mix of peach, pink, gold, and clear sequins and tiny teal beads. At the last second I decided to make my shaker background colorful so I painted a piece of watercolor paper with scattered straw, wild honey, and worn lipstick distress ink and once it was dry I heat-embossed it with holographic embossing powder. I sealed my shaker with the watercolored background to create a frosty sunrise. Finally I adhered my banner and my owls to the front of the shaker with liquid adhesive. ...so I could create a LED circuit underneath my card to light up a few of my Christmas lights! I also used a twinkle effects sticker so that my lights would blink on and off when you press the penguin's belly. In the above photo I used a paperclip to squeeze together the circuit so you could get the effect without my finger in the way! You can also see areas where I didn't have a layer of foam mounting tape on the back of the watercolor panel so it appears lighter in some spots...I think it kinda looks like the Northern Lights which was totally unintentional but I love it! I used white LED stickers but colored them with copic markers to create the colored lights. It's a fun surprise to see the lights light up! And that's curtains for me!! Don't forget to comment on any or all of my previous Leading Lady posts for a chance to win a $30 gift certificate to Winnie & Walter! Thanks so much for visiting each weekend and I hope I inspired you to break out those Winnie & Walter stamps and get crafty! Have a wonderful holiday weekend! These are absolutely DARLING. Love the sweet owls and the Christmas lights?! Perfect! Oh my, super cute cards. Congrats on being leading lady! Well done! Oh wow! Both of these cards are so adorable! I am loving that little igloo and penguin. You did a fantastic job with the lights!! These are all so super cute! Love those little owls. Amazing cards Jessica. Following you on IG so I get the full benefit of your talent. Such an inspiration. I love these sweet cards! Happy Owlidays is a favorite set! Season's Tweetings is another! Such delightful cards! Darling cards. My favorite is the Noel card. Fabulous background coloring and I love the lights on the igloo. Well done. All wonderful cards!! Love the lighted igloo...so cute!! Awwwwe!! These are sooooo SWEET!!! Amazing cards, can't wait to receive these stamp sets in the mail!! These are soooo cute! The lighted igloo is my favorite Christmas card ever! So many details on that first card. Super cute and live the shimmery background too. The lights on the second one is genius. Love them both! Jess you have such a way with CUTE!!! and these little birds are most definitely your cup of tea! LOve the shaker moon, and I've yet to be brave enough to try the Chibi lights!! Thank you so much for showing us so many darling ways to highlight W&W awesome products!! These are both adorable. Love those cute owls and so cool that the penguin card lights up. These are all so gorgeous! The Christmas lights card is brilliant! I LOVE it! OH my gosh, Jess; you've added another layer to the definition of cute with these amazing, charming, delightful projects! The little owls and sweet penguin are darling; the interactive elements elevate them to ingenious! The lights on the igloo: LOVE! 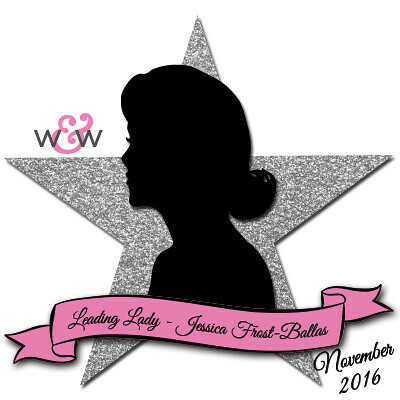 You've been a most impressive Leading Lady; thank you for all the inspiration this month! You are a huge inspiration. I can't wait to try some new ideas. Fabulous cards as usual Jessica! Love the Christmas lights! So cool! Your cards are just adorable, and I LOVE the cute owl shaker card, I always enjoy your fabulous designs. Really fantastic cards, I love the adorable owl and penguin and your Christmas lights are amazing! Adorable! Love the non-traditional colours and fab background on your first card and the fun surprise on the second card.